The top four teams in the Premier League this weekend before the action starts have all passed the 60-point milestone. They are the only clubs to do so and are the only four with any realistic chance left of winning this season’s title. (Some would argue Arsenal’s realistic chance has gone, and perhaps it has, but that’s a longer argument). This season can certainly be characterised as having had four title-chasers on the one hand – Chelsea, Liverpool, Manchester City and Arsenal – and the ‘other 16′ clubs on the other, with those ‘other 16′ currently led by Everton. 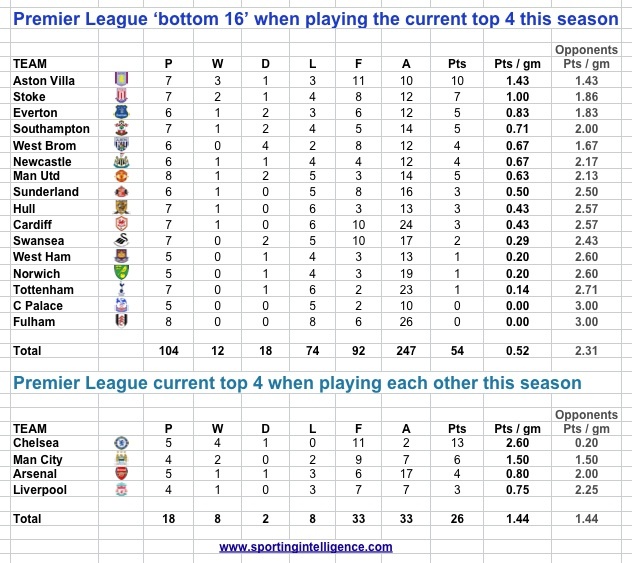 How have Everton and the other 15 fared when they have come up against the top four? Which team(s) in the ‘other 16′ have caused the leading foursome the most damage? Which clubs will still have a lot to say in the remaining games as they come up against those top four? What has happened when the top four have played each other so far? The graphics below will help us answer those questions but first some conclusions. 1: The four-way title race is now in fact a three-way title race, with Chelsea, Liverpool and Man City in contention. 2: Using patterns from earlier in the season to predict what will happen next, we think Chelsea and City could finish extremely close together, perhaps even on the same number of points, with Liverpool not very far away at all. 3: The prediction in the previous sentence is based on Chelsea’s dominance so far against fellow top-four teams, and also on Liverpool’s relative weakness, so far, within that elite group against fellow top-four teams. Our forecast says Liverpool, based on this relative weakness, will not do well in their vital games to come against Chelsea and City. BUT Liverpool face both those sides at home, and in form. 4: So with all other things being equal, the title, a genuine three-way race, will hinge on Liverpool’s home games on 13 and 27 April against City and Chelsea respectively; and on a smattering of games by top-four teams against ‘other 16′ rivals who have proved hard nuts to crack to the top four as a whole. (And Arsenal, of course, will insist they can still play a big part in the title, starting against City on Saturday). First let’s look at the ‘other 16′ and their records against the top four this season so far; and the top four against each other. It turns out that so far Aston Villa have had the most success when taking on the top four, including home wins over Chelsea and City and that first day of the season win at Arsenal. Stoke are the only other team to have recorded two wins, at home to Chelsea and Arsenal. Three clubs still have three games each to play against the current top four: West Ham, Norwich and Crystal Palace. Palace are one of the two clubs who have yet to muster a single point in their contests with the top four. The other club in that bracket, Fulham, have already completed their programme of games with eight losses from eight. Manchester United, too, perhaps to their relief, do not face another meeting with the four leading clubs this season. West Brom are worthy of a special commendation: they have only been defeated twice in six “top four” matches, drawing the other four. They still have to visit City and Arsenal. When it comes to games amongst themselves Chelsea clearly deserve their current top spot, winning four and drawing one of the five games between the elite so far, gaining an average of 2.6 points from those games and conceding 0.2 points per game. They still have to visit Anfield, as do City. The other remaining game of that tiny but so significant league is Arsenal v City on Saturday evening. So how will the title be decided? 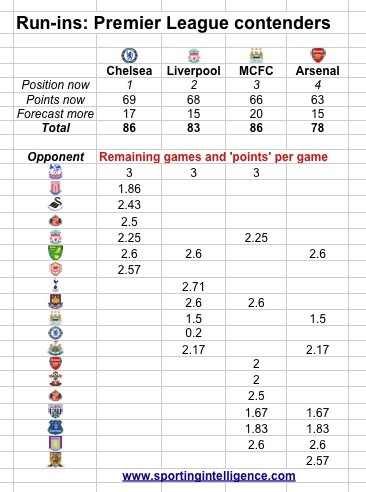 The graphic below attributes ‘theoretical’ points to each of the remaining fixtures for the top four clubs, ‘theoretical’ because the points assigned are those that each opponent has given up, so far, on average, in games against top four clubs this season. ‘Theoretical’ because it is not possible for Liverpool to take 2.71 points from their game with Spurs, or for Arsenal to take 1.67 points from their date with West Brom. With seven games remaining, this theory gives Chelsea 17 more points, Liverpool 15, City 20 (from nine games) and Arsenal 15 (from seven). That would leave Chelsea and City on 86 points each and Liverpool on 83. That cannot happen, not in the theoretical way we imagine. But it can be close. It almost certainly will be close. And the importance of the games remaining between the top four teams cannot be over-stressed.